SENSE OF PLACE. CEO Kevin Johnson joins Starbucks partners at company headquarters in Seattle. This article appears in print in the November 2018 issue. See more about the winners of the 2018 Community Impact Awards here. Click here for a free subscription. Starbucks has long been a model for corporate social responsibility. It was among the first major corporations to offer part-time employees generous health insurance and, more recently, free college tuition. It has sought to source its coffee beans ethically and sustainably, and has been a leader in working to minimize its environmental footprint. The company, which committed in 2013 to hiring 10,000 veterans and military spouses nationwide, announced last year that it had hired 17,000 and increased its commitment to 25,000 by 2025. 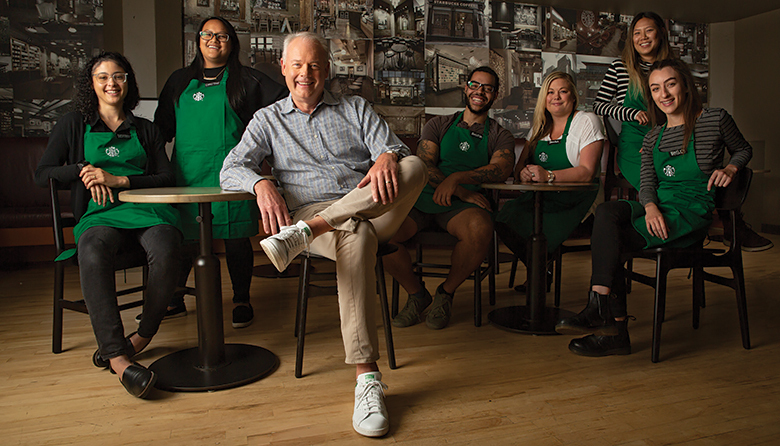 More recently, under the leadership of CEO Kevin Johnson, Starbucks has taken on challenges such as family homelessness here in its hometown. Getting families off the street has become a key pillar of Starbucks’ hometown social impact agenda. The company has partnered with local businesses, government agencies, foundations and individuals to provide a safe, warm place for children to sleep every night. Since 2016, both Starbucks and The Starbucks Foundation have championed the No Child Sleeps Outside initiative, helping Mary’s Place provide safe shelter for homeless families in the region. To raise funds for this initiative, Starbucks encourages customers to donate to Mary’s Place through the Starbucks mobile app, and, to date, The Starbucks Foundation has contributed more than $2.5 million. Thanks in part to donations from this initiative, in 2018 Mary’s Place served 474 families, provided 159,020 meals, referred 178 families to stability, assisted 83 guests in obtaining jobs and moved 123 families from cars to housing. This past summer, Starbucks partnered with Pearl Jam to raise funds for unsheltered families. Contributions made by customers through the mobile app were matched $2 for every $1 by The Starbucks Foundation. In addition to Mary’s Place, The Starbucks Foundation supports nonprofits committed to helping unsheltered families, including the United Way of King County, The Home Fund, YMCA Seattle-King-Snohomish, Wellspring Family Services and the Jubilee Women’s Center. Starbucks employees have also volunteered with various organizations addressing homelessness in King County, from welcoming families at the Family Resource Exchange to preparing meals for Mary’s Place’s residents to furnishing and decorating apartments for families transitioning to stable housing. One of the nation’s largest bank-based financial services companies, KeyBank boasts a National Community Benefits plan that includes $16.5 billion in investments across its markets. Investments are designed to provide innovative banking services to underserved and low- to moderate-income communities. Locally, KeyBank supported more than 300 nonprofits last year with more than $1.6 million in funding. And earlier this year, it marked its first Community Impact Day by donating more than $1.9 million to 17 area nonprofits.